Emotions can be challenging to navigate. They come and go with the same impermanence as waves yet often carry the same brute force as a storm at sea. We can find ourselves overwhelmed by their force, whether the emotions that come are in the form of anger, fear, sadness, disgust, anticipation, joy, or any other feeling. Our emotional landscape when heightened can be an intricate intermingling of numerous feelings and sensations that often boils down to an indescribable experience of unease and discomfort. In this melting pot of emotions, we can find ourselves unable to find clarity, peace, and stillness. Drown out and/or numb the rising sensations with food, drink, or other substances. In some cases, we do need to withdraw from certain situations to see things more clearly, and in some moments it can be helpful to engage our mental facilities to help understand the situation at large; however, more often than not we revert to these habitual ways of being in order to suppress, avoid, or distract ourselves from the present moment. The problem with these defense mechanisms is that they do not help us to overcome the sense of suffering that accompanies the raw sensations that we experience. When we incorporate mindfulness into our emotional landscape, we start to develop a different relationship to the challenging feelings that arise. The stories we tell ourselves about prior events leading to the feelings at hand can easily become entangled with the raw emotion itself. Even when we are not consciously aware of what is moving through us or another, there are a variety of signs that can inform us about what emotions are at play. Once we understand what emotions are present, we can look more closely at what they are signifying. Here are few examples of the visual signals that an emotion is present and what the underlying meaning might be. When expressed outright, anger comes out as a roar; however, it is sometimes more controlled. More subtle signs include a sharp edge in the voice, narrowed lips, focused eyes, and lowered brows. Ranging from dissatisfaction to boundary challenges to threat. Fear shows up on the face as wide eyes, stretched lips, and raised eyebrows. We may physically withdraw from whatever the threat is. Other signals include screaming, heavy breathing, and a pulling away of the head. Ranging from slight concern to panic. Disgust appears visually as a protruding tongue, a raised upper lip, and a wrinkling of the nose. Ranging from wishing for something to be kept away to the belief that something is socially or morally wrong or unclean. This emotion shows up as a frown, as raised cheeks, as eyebrows drawn upwards and together, and as tears. A quivering voice and sobbing often accompanies the emotion. A desire for comfort or empathy. Smiles and wrinkling around the outer corners of the eye are most common. A sign of relief or laughter are auditory cues. From contentment with the feelings present to an encouragement of social interaction. Getting to know these signs and meanings can help us to see each emotion in a new light and to understand the deeper meanings behind them. When we let go of the stories attached to the feeling and look more closely at what is trying to be conveyed and how we are trying to convey it, we can manage our emotions more effectively. It is not uncommon to be overcome by a particular bodily sensation when a certain emotion washes over us. When we feel depressed, we might experience heaviness within the body, or it might feel as if energy flow within us is stagnant. When we are angry, we may feel some tightness in the forehead or increased activity in the head region in general. Whatever the pairing, it turns out that each emotion seems to appear across cultures. Research conducted by Finnish scientists sought to discover how bodily sensations pair with various emotions. Over 700 volunteers participated in the study that linked various basic and complex emotions with felt increasing and decreasing activity within various bodily regions. 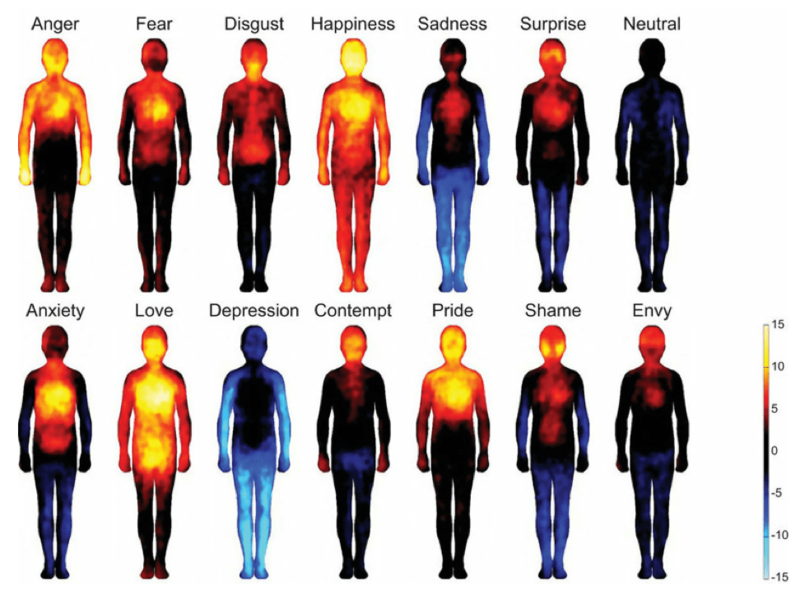 The result was a heat map that provides insight as to where different emotions manifest within the body. The results were congruent between West European and East Asian samples, suggesting that the link between emotions and the body is a universal phenomenon. Understanding that emotions have a direct effect on the sensations we perceive within the body can help us to become more mindful of the intimate link between body and emotion. It provokes the question: can we become more aware of the very raw, physical manifestation associated with a rising emotion, rather than becoming consumed by the story that led to it? Recognition of the body’s reaction and potential contribution to emotions can empower us to move through them mindfully as we’ll see in the next section. Emotions are part of the human experience. In and of themselves they are neither good nor bad, so becoming mindful of them does not have to entail condemnation, judgment, or suppression; in fact, mindful awareness of our emotions is quite the opposite. Opening to our emotions mindfully is possible only from a place of unconditional love. It is a continual practice that offers us a new vantage point from which to relate differently to these energetic flows. When emotions arise consider these four ways to open up to them mindfully. 1. Turn towards the emotion. There is a common tendency to move away from difficult emotions when they arise. While this may have once served as an effective defense mechanism, we can help ourselves to move through the emotion more effectively by turning towards it. By taking a few deep breaths and gently opening ourselves to whatever is present, we are able to transition through our emotional landscape with greater understanding and acceptance. The key here is to opening from the heart and staying open to whatever arises. 2. Create space by identifying the emotion(s) – without judgment. It is easy to become caught up in the story associated with the emotion – why we feel it, who is responsible, and how it could have been avoided. While there is a time and place for this inquiry, it can be useful to detach from the emotions when we are in the heat of them. We can practice this by becoming aware of what exactly is moving through us. Rather than saying to ourselves, “I am angry,” which often leads to, “because…” we can instead simply notice what is present. Simply witness ‘anger’, ‘grief’, ‘sadness’, or whatever is the case as though it were a separate entity. Open to this energetic presence with compassion and curiosity, noticing if the mind intervenes with judgment. Come back to an open heart. 3. Feel into any bodily sensations that are present. When we become caught up in a web of emotions, we can open our awareness to the entire body. What do we notice? Where do we sense increased or decreased activity? Even numbness can be observed. Feeling into the way the emotion presents itself in the body can help us to create some sort of distance in-between ourselves and the energy moving through us. As we practice creating this distance, strengthening our awareness of it, we come to realize that our emotions are just a happening that can be witnessed from a quieter, more peaceful place. 4. Become aware of the impermanence of this state. Feelings, thoughts, and sensations all come and go; such is the nature of life. When emotions rise we can heighten our awareness of the transitory nature of our experience. Through this opening to the flow of our emotions, we become less consumed by them. We start to loosen our grip on the beliefs we hold about them. We come to realize that we are not, in fact, our emotions; and through this realization we find strength to journey through the storm in our sails. The signal of an emotion describes the universal ways that emotion is displayed in the face and/or voice. There can also be other vocal tone changes and body language indicators, but these are not included here because they are often culturally informed and learned as opposed to universal. The message is what the emotion is telling us. All emotions have a message that is a response to the world around us. In the voice, anger generates a roar if not controlled; when anger is controlled, the voice may have a sharp edge that is very detectable. In the face, the signal includes glaring eyes, lowered brows and narrowed, tightened lips. When people hear or see an angry signal, they are typically hurt just by the perception of the signal, and may retaliate with angry actions. The message of anger is “get out of my way.” Anger can carry a message ranging from dissatisfaction to threat. Common signals are very wide open eyes, horizontally stretched lips and raised, drawn together eyebrows. There may be movement away from the target. Screams may accompany intense fear. Lesser fear signals can include heavy breathing, a head position slightly backwards and away, and horizontally stretched lips accompanied by tightened neck muscles. The message of fear is “help me”; it can range from showing low-level concern to conveying panic. There are three facial expressions associated with disgust. The first is sticking the tongue out as if the person is getting something out of their mouth. The second is raising the upper lip, but it is relaxed and not tense, which can display gums and teeth depending on the shape of the mouth. The third is wrinkling of the nose and raising of the nostrils. These expressions can occur separately or in unison. The message of disgust is “get away from this.” It can show others that the target of disgust is to be kept away from or that the target is unclean, dirty or socially/morally reprehensible. The signals of sadness include a frown (lower lip pushed up slightly and lip corners pulled slightly down), the inner corners of the eyebrows drawn up and together in the center of the forehead, raised cheeks and tears. The vocalization of sadness can include sobs and heaving and quavering of the voice. The message of sadness is “comfort me.” It encourages, or intends to encourage, empathy from others. Enjoyment signals include the Duchenne (authentic) smile, activation of a smile (lip corners pulled obliquely up), and activation of the orbital eye muscles that tighten the lower eyelid and create wrinkling around the outer eye corners (especially with age). Enjoyment also includes vocal signals such as the sound of relief (a sigh or exhalation) and the sound of amusement (laughter or giggling). The message of enjoyment is “this feels good.” It encourages engaging in social interaction. Moods are longer-lasting cousins of an emotion that cause us to feel the related emotion repeatedly without any clear trigger. IRRITABLE - Predisposed to becoming angry, easily provoked. APPREHENSIVE - Anxious that something bad will happen, on edge. DYSPHORIC (OR FEELING BLUE) - An enduring feeling of discouragement or disappointment. ELATED - A long-lasting, generalized good feeling. Certain personality traits are related to specific emotions. A hostile person is often angry and is known to others for the frequency of anger responses to the world. Often anger occurs with any frustration; the threshold for frustration is low. Hostile people may experience regret afterward and apologize for their anger, but nevertheless continue to respond angrily. Sometimes hostile people express their anger in a nasty way, using words to demean and cause psychological pain to others. A shy or timid person. This personality type is likely to avoid risks and uncomfortable situations. Timid people may perceive the world as full of difficult situations. A person who often feels disgusted by others may have an inflated sense of self-worth and a hyper-aversion toward others. Someone who is disgusted or dissatisfied with everything can be unpleasant to be around. A somber person who is often feeling low may have clinical depression or may simply have more frequent feelings of sadness. This person may hold the perspective that life is hard and difficult. A cheerful person may also be thought of as optimistic. This person sees the world in positive way and can easily be made to laugh and feel enjoyment. Each emotion relates to distinct psychopathologies, which describe persistent behaviors that interfere with one’s ability to function. ​A tendency to cause physical or verbal harm in inappropriate contexts. Anger may be out of control, or passive but persistently preoccupying. Intermittent Explosive Disorder - Impulsively aggressive and assaultive behaviors out of proportion to triggers. Oppositional Defiance Disorder - A pattern of defiant, disobedient and hostile behavior in children or teens toward parents and people in authority, beyond normal age-appropriate misbehavior. Antisocial Personality Disorder - Characterized by a pervasive pattern of disregard for the rights of other people that often manifests as hostility and/or aggression. Deceit and manipulation are also central features. Disruptive Mood Dysregulation Disorder - Severe recurrent temper outbursts manifested verbally (e.g., verbal rages) and/or behaviorally (e.g., physical aggression toward people or property) that are grossly out of proportion in intensity or duration to the situation or provocation. Anxiety states involve prolonged fear without knowledge of the source of the threat, and incidents of panic (episodic attacks of severe anxiety). Social Anxiety Disorder - A persistent fear of one or more social or performance situations in which the person is exposed to unfamiliar people or to possible scrutiny by others. The individual fears that he or she will act (or show anxiety symptoms) in a way that will be embarrassing and humiliating. Post-Traumatic Stress Disorder (PTSD) - A mental health condition that’s triggered by an often overwhelmingly terrifying event — either experiencing it or witnessing it. Symptoms may include flashbacks, nightmares and severe anxiety, as well as uncontrollable thoughts about the event. Avoidant Personality Disorder - Characterized by a pervasive pattern of social inhibition, feelings of inadequacy and a hypersensitivity to negative evaluation. People with this disorder are intensely afraid that others will ridicule them, reject them or criticize them. Generalized Anxiety Disorder - An anxiety disorder that is characterized by excessive, uncontrollable and often irrational worry and apprehensive expectation about events or activities. Obsessive-Compulsive Disorder (OCD) - An anxiety disorder characterized by intrusive thoughts that produce uneasiness, apprehension, fear or worry (obsessions); repetitive behaviors aimed at reducing the associated anxiety (compulsions); or a combination of both obsessions and compulsions. The psychopathology of disgust includes feelings that prevent everyday interaction with the world, the self or others. Disgust can be a paralyzing feeling that makes simple interactions (such as eating) extremely painful if not impossible. Disgust and fear are both thought to contribute to various phobias, such as fear of small animals. Anorexia Nervosa - A distorted self-image that may be maintained by various cognitive biases that alter how the affected individual evaluates and thinks about their body, food and eating. People with anorexia nervosa often view themselves as disgusting, overweight or “big” even when they are underweight. Body Dysmorphic Disorder - A body-image disorder characterized by persistent and intrusive preoccupations with an imagined or slight defect in one’s appearance or a feeling of disgust with one’s appearance. Bulimia - A disorder characterized by repeated binging on large quantities of food followed by induced vomiting; both the binging and purging may be accompanied by feelings of self-disgust. Sexual Aversion Disorder - Characterized by disgust, fear, revulsion or lack of desire in consensual relationships involving genital contact. Depression is a well-known type of psychopathology that is reported to affect over 25% of the population. Depression interferes with daily life and causes pain for both the sufferers and those who care about them. Depression is a common but serious illness. Major Depressive Disorder - Also known as clinical depression, major depression or unipolar depression, this is a mental disorder characterized by a pervasive and persistent low mood that is accompanied by low self-esteem and by a loss of interest or pleasure in normally enjoyable activities. Dysthymia - Sometimes also called neurotic depression, dysthymic disorder or chronic depression, this is a mood disorder consisting of the same cognitive and physical problems as depression, with less severe but longer-lasting symptoms. Bipolar Disorder - Also known as bipolar affective disorder (and originally called manic-depressive illness), this is a mental disorder characterized by periods of elevated mood and periods of depression. Unlike with other emotions, it is hard to imagine enjoyable emotions contributing to challenges in managing our everyday relationships, work and ability to meet our basic needs. However, pathological enjoyment is quite serious; hyper-elevated states of enjoyment can cause delusions in addition to feeling good, which can lead to destructive behaviors. Mania/Manic Episode - Mania at its extreme is commonly characterized by frenzied, ungovernable exuberance — essentially elation not grounded in reality. Frequently, confidence and self-esteem are excessively enlarged, and grand, extravagant ideas are expressed; this is called “grandiosity.” Mania is often part of bipolar disorder. Cyclothemia - This is characterized by moods that shift noticeably up and down from a person’s baseline. The person may feel on top of the world for a time, followed by a low period when their feeling is somewhat blue. Between these cyclothymic highs and lows, the person may feel stable and fine. Actions can be intrinsic (without conscious intent) or intentional (an active attempt to enact change), or both. Here are some ways to counteract emotional states. Impediments involve blocking a positive emotion; antidotes involve reversing negative ones. Annoyance - Patience, open-mindedness, concern for others. Frustration - Letting go, letting go of grasping, putting things in a larger perspective. Argumentativeness - Making effort to understand the other’s perspective, cognitive empathy, benevolence, wishing to solve the problem through a mutually agreeable solution. Exasperation - Letting go of grasping. Patience, inner calm. Trying to understand the causes and conditions that brought about the undesirable situation. Vengefulness - Contemplating the negative effects of taking revenge, in the short and long term; forgiveness not as condoning harmful behavior but as breaking the cycle of resentment and hatred. Fury - Taking a break, physically and mentally, from the circumstances that brought fury about. Looking at fury itself with the eye of awareness as if gazing at a raging fire and slowly letting it calm down. Trepidation - Trying to ponder what can be done. Calming the mind gives the best chance to find the appropriate solution to what caused the trepidation in the first place. Nervousness - Trying to ponder what can be done. Calming the mind gives the best chance to find the appropriate solution to what caused the nervousness in the first place. Anxiety - Making a special effort of letting go of ruminations about the past and anticipations of the future. Dread - Remaining as calm as as possible. Seeing what can be done for yourself and for others as well. Panic - Making an effort to see if anything can act as a mitigating factor (depending on the causes involved). Horror - Trying to see if anything can be done immediately. If that is not the case, creating distance to see if something can be done from afar. Responding with firmness and compassion, never with hatred. Terror - Instilling some calmness in the mind in order to take most appropriate decision. Aversion - Evaluating impartially the degree of harmfulness, taking appropriate measures, and then letting aversion dissolve in a space of mindful awareness. Dislike - While evaluating impartially the ethical issues, generating compassion so as to find the best way to remedy the causes and conditions that triggered dislike. Distaste - Evaluating impartially the degree of harmfulness, taking appropriate measures, and then letting distaste dissolve in a space of mindful awareness. Repugnance - Evaluating impartially the degree of harmfulness, taking appropriate measures, and then letting repugnance dissolve in a space of mindful awareness. Loathing (Self) - Using healthy regret to generate the determination to improve oneself; whenever possible, repairing the harm caused to others. Not falling into pessimistic guilt, thinking that one is fundamentally bad and that that is the way one is bound to remain. Not underestimating the potential for change. Loathing (Others) - Adopting the outlook of a caring physician, who might deeply disapprove certain behaviors but will focus on doing all that is possible to cure a person of their afflictions. Revulsion - Adopting the outlook of a caring physician, who might deeply disapprove certain behaviors but will focus on doing all that is possible to cure a person of their afflictions. Abhorrence - In the case of toxic substances or situations, doing the best one can to calmly avoid them. In the case of actions, adopting the outlook of a caring physician, who might deeply disapprove certain behaviors but will focus on doing all that is possible to cure a person of their afflictions. Disappointment - Understanding that sadness is natural in appropriate circumstances, but also that experiencing loss is part of life and that one should not let oneself be overwhelmed. Trying to find a place of peace within oneself and thinking of constructive things that could be done instead. Distraughtness - Understanding that a permanent state of sadness will not bring any real benefit. In the case of mourning someone, falling into long-term sadness and despair should not be seen as an homage paid to that person. It is better to pay homage by doing meaningful and altruistic acts. Discouragement - Understanding that a permanent state of sadness will not bring any real benefit. In the case of mourning someone, falling into long-term sadness and despair should not be seen as an homage paid to that person. It is better to pay homage by doing meaningful and altruistic acts. Helplessness - Understanding that a permanent state of sadness will not bring any real benefit. In the case of mourning someone, falling into long-term sadness and despair should not be seen as an homage paid to that person. It is better to pay homage by doing meaningful and altruistic acts. Misery - Understanding that a permanent state of sadness will not bring any real benefit. In the case of mourning someone, falling into long-term sadness and despair should not be seen as an homage paid to that person. It is better to pay homage by doing meaningful and altruistic acts. Grief - Understanding that a permanent state of sadness will not bring any real benefit. In the case of mourning someone, falling into long-term sadness and despair should not be seen as an homage paid to that person. It is better to pay homage by doing meaningful and altruistic acts. Despair - Understanding that a permanent state of sadness will not bring any real benefit. In the case of mourning someone, falling into long-term sadness and despair should not be seen as an homage paid to that person. It is better to pay homage by doing meaningful and altruistic acts. Anguish - Realizing that things and people are impermanent by nature. Revolting against this cannot lead to a fulfilled life. Schadenfreude - Perceiving the destructive aspect of it and trying to generate benevolence toward the person. Pride - Humility. Putting things into perspective and realizing that there are many other people with similar or even better qualities than one’s own. Understanding that one could do something not just because one is so special, but because of many interdependent causes and conditions in which others have taken part. Sensory Pleasures - Being unable to appreciate the quality of the present moment. Relief - Persisting in worrying unnecessarily. Amusement - Tending to see things in negative ways. Ecstasy - Grasping, attachment and any other afflictive mental state (animosity, envy, arrogance, etc.). Fiero - Vanity, narcissism, failing to acknowledge with gratitude all those who contributed to make an achievement possible. Naches - Pride mixed with arrogance and with partiality that makes one feel contemptuous about others’ achievements. Rejoicing - Envy, jealousy, pride. Compassion / Joy - Regret at having done something good at the cost of some personal efforts. Narrow-mindedness when caring only for a limited number of people who are close.